The adventure begins with a coach ride from Queenstown to the Divide on the scenic Milford Road. From here you climb a well-graded track to Key Summit, where you can sit among the alpine plants and partake in 'The Annual General Meeting of the Mountains'. You then descend to Lake Howden hut for a hot drink and picnic lunch before gradually climbing through lush silver beech forest to the base of Earland Falls: quite a sight in wet weather! 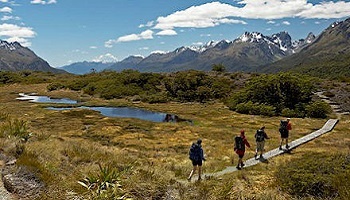 Look over the Hollyford Valley to the ice capped Darran Mountains before descending to the lodge at Lake Mackenzie. This day consists of 5-6 hours walking, covering a distance of about 14 kilometres. Leave the ancient forest draped in moss and lichen, and enter the alpine world of daisies, buttercups gentians and edelweiss. Here you have a full vista of the Darran Mountains across the Hollyford Valley, which slices through Fiordland to the distant Tasman Sea at Martins Bay. 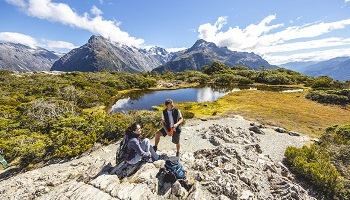 At the Harris Saddle (1277m), you can ascend Conical Hill for a panoramic view of the surrounding peaks. After walking around Lake Harris you come into more intimate terms with the mountains towering above the upper basins of the Routeburn River. This day is 5-7 hours of walking, covering 15 kilometres. 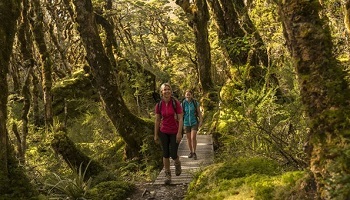 Take time to enjoy the dramatic landscape around the Falls before descending to the alpine pastures of the Routeburn Flats. Your guides will take the scenic route through the meadows and find the deepest green pool for you to picnic beside. The track shadows the river as it roars through a magnificent gorge before plunging beneath the unyielding rocks at the Sump. From here it is a gentle walk through columns of red beech trees to the Road End. A coach will take you back to Queenstown stopping at Glenorchy for refreshments on the way. This final day is slightly shorter, around 3-4 hours of walking; a distance of just over 10 kilometres.